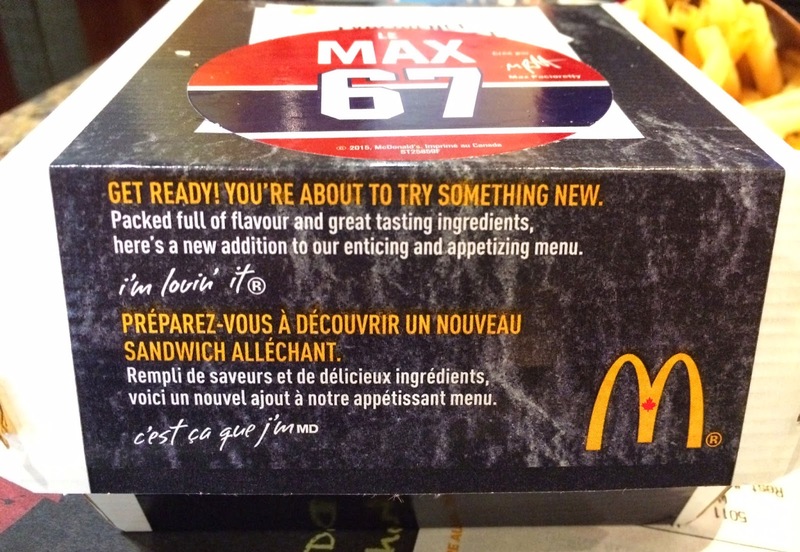 When we're walking back to the hotel after having grilled cheese because it's a National Grilled Cheese Day (April 12th), my husband spotted a new burger at McDonald's. 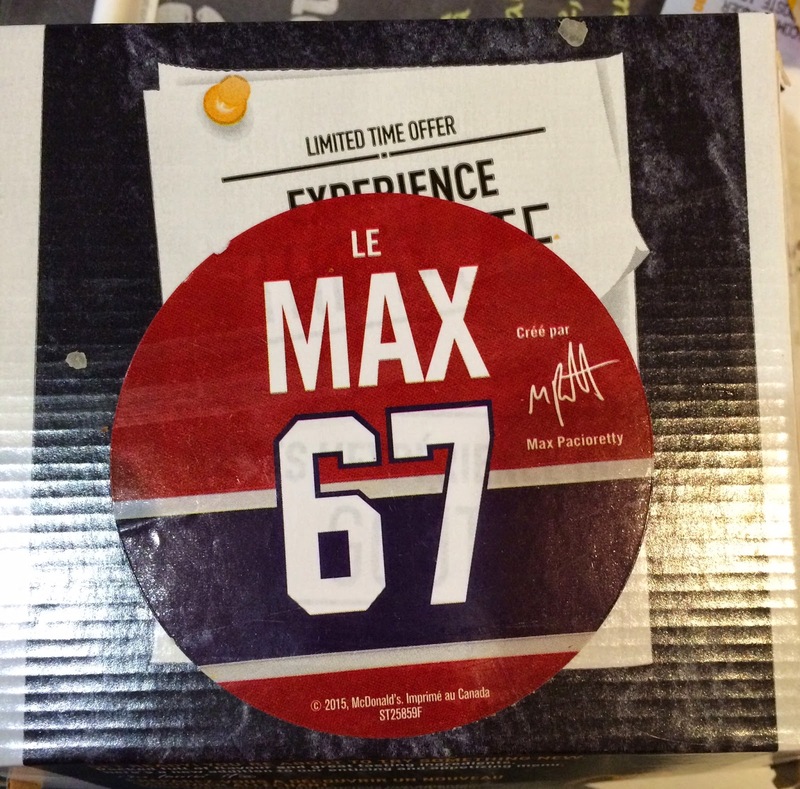 It's called "Le Max 67" and we'd never heard about it, and he assumed it's a limited product, we decided to try it even though we're full. 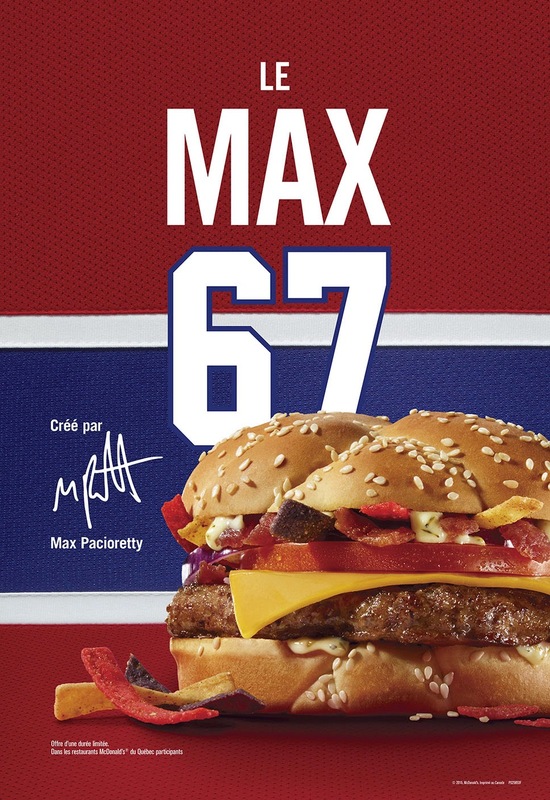 According to an article in French, this burger was launched on March 18 and will be available till April 20, 2015 at participating locations in Quebec only. 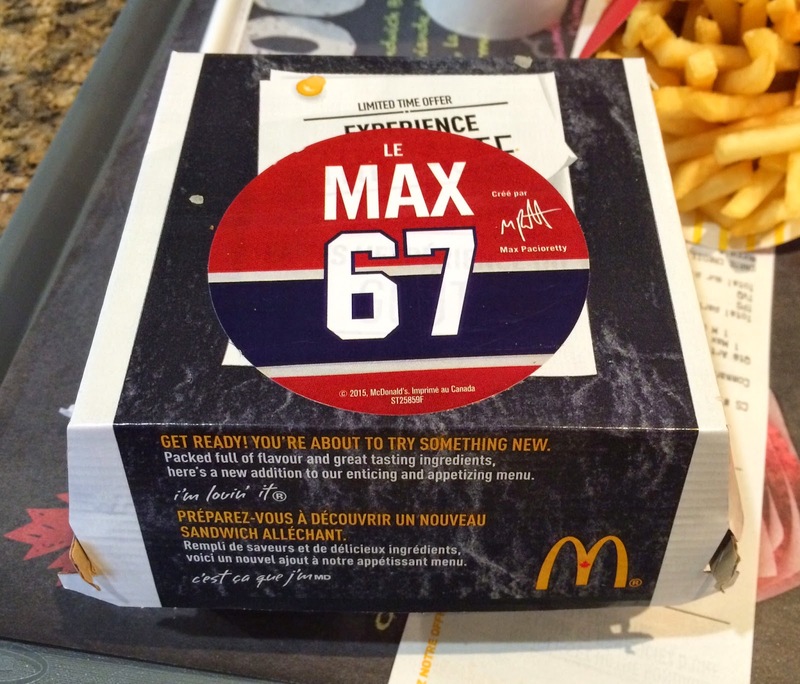 And this burger was created in honor of Max Pacioretty of the Montreal Canadiens, the oldest team in NHL. 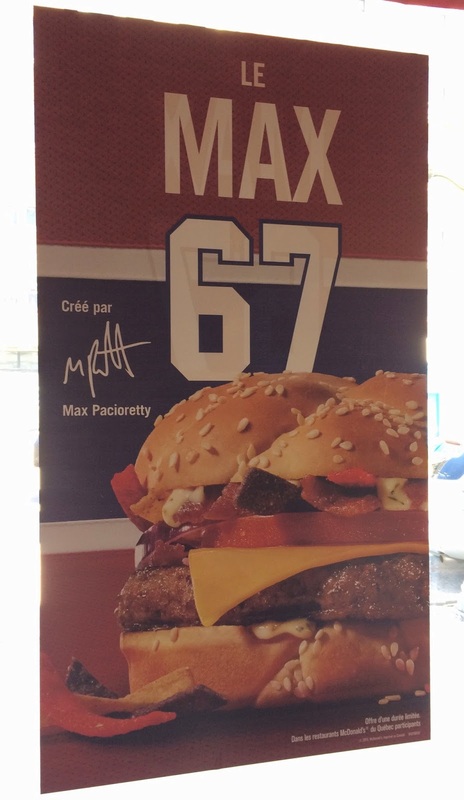 At the branch, the electric menu board was showing this "Le Max 67" once every a couple of minutes but so short that it's hard to capture the advertisement. And there's only one poster on the window. 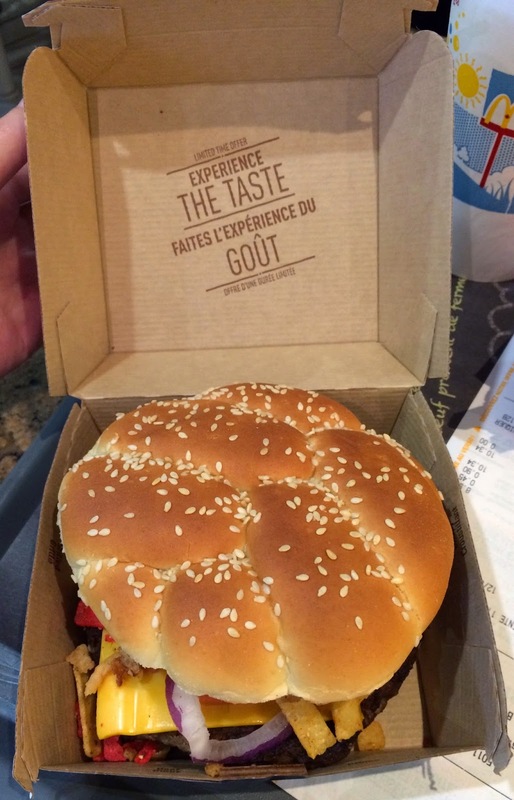 When we went into the restaurant, we didn't know the details of the burger or till when it'd be available, we decided to get it as it was even though I could tell there're some mayonnaise. "Get ready! You're about to try something new. Packed full of flavour and great tasting ingredients, here's a new addition to our enticing and appetizing menu." The buns looked the same as the ones used for Sirloin Third Pound Burgers with white sesame seeds and woven-look surface. 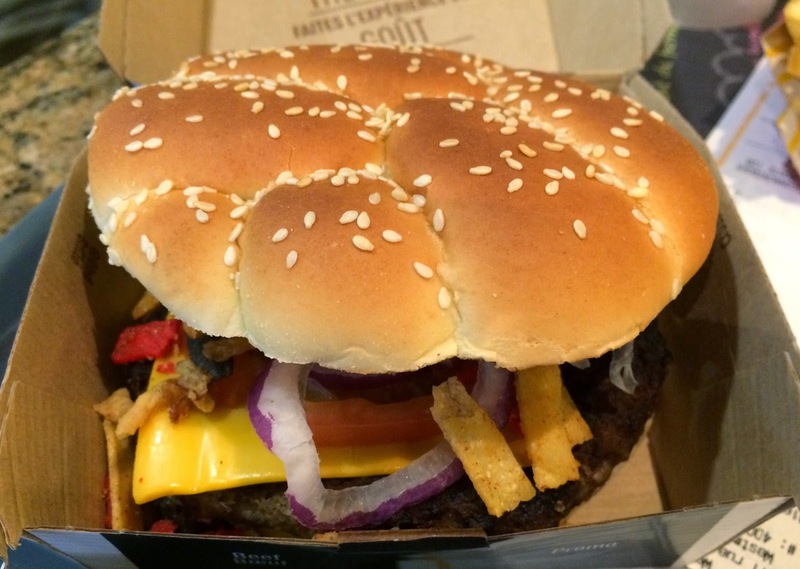 From the side, I could see A LOT of fillings. 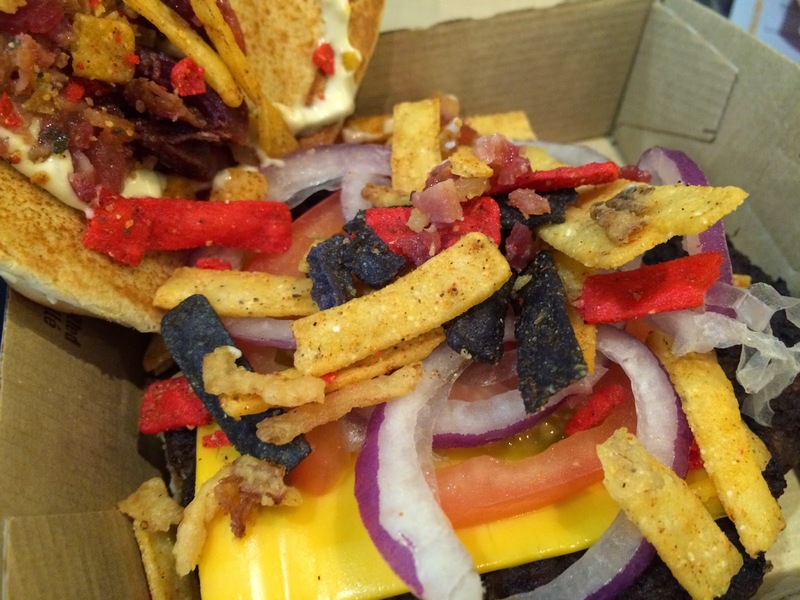 Underneath the upper bun, there're white dressing, bacon bits, 3 colored tortilla chips, red onions, tomato, yellow cheese and a patty. 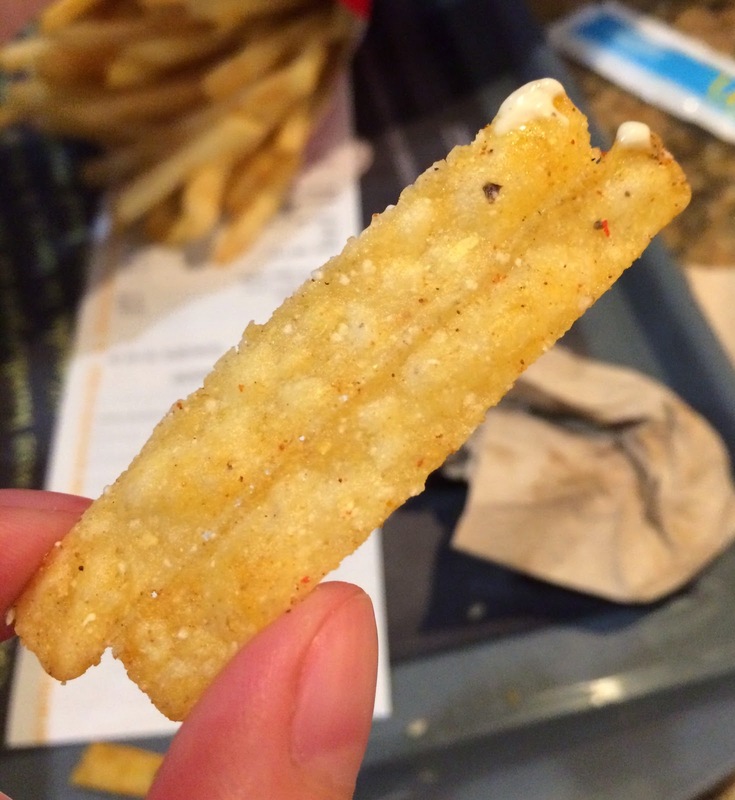 The white dressing looked like tartar sauce but it had some spiciness similar to chipotle, and I could handle it ok. The colors of tortillas were red, blue and yellow (plain) like the uniform of Montreal Canadiens. --- Not sure about the yellow thou. And actually he's right when I looked at the article that shows the recipe; Angus beef and buns. 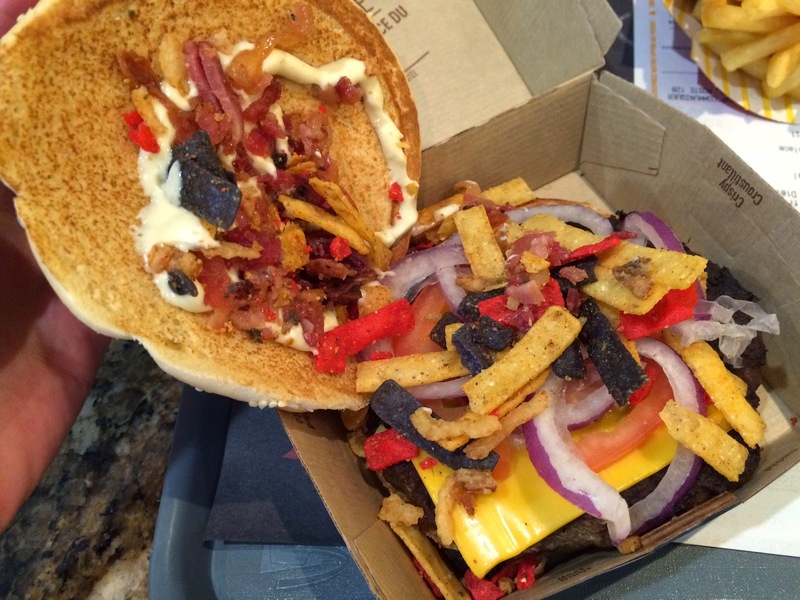 This burger was hard to eat as the tortilla chips were falling off while eating and the sauce was very slippery. 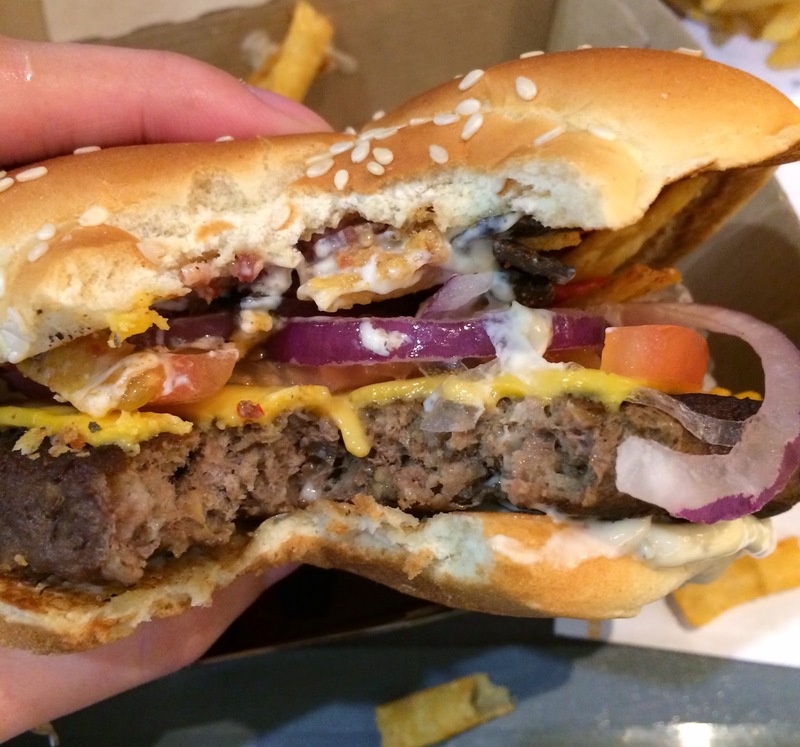 Though, the crunchiness of the tortilla, soft buns, beet patty, fresh onions and tomato and the yellow cheese were all mixed well and much tastier than I thought as the sauce wasn't only creamy and disguising mayonnaise that I hate, but also had some spiciness. I heard Angus beef patty was really juicy but this one wasn't and it's almost burnt and dried, so it's a bit disappointing but still I was happy to be able to try this very limited burger. 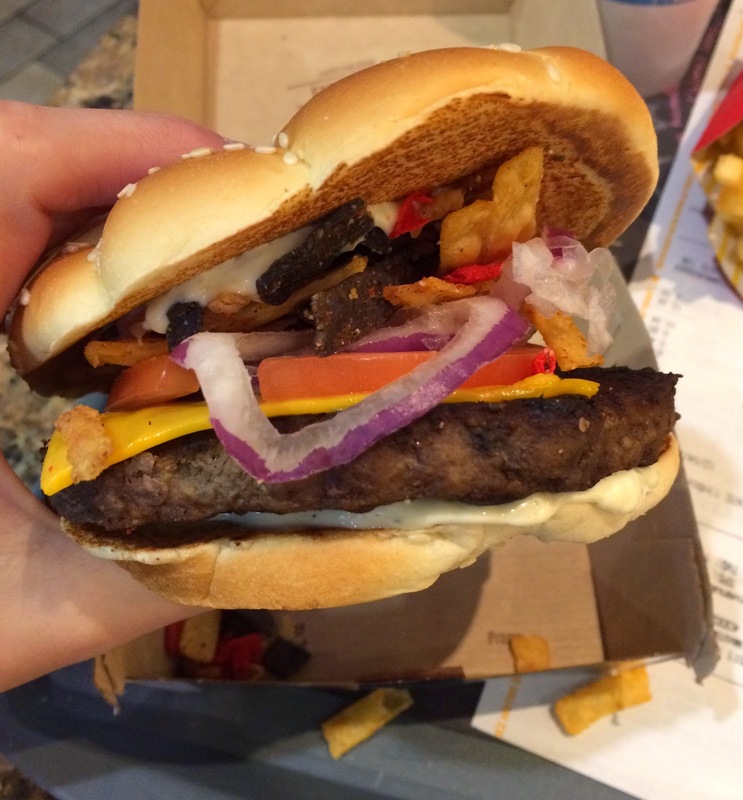 Underneath the patty, there's another layer of the sauce, so I had to scrape it off.